Bowmore is a whisky distillery located on the Isle of Islay (pronounced “eye-lah”), Scotland. The distilleries on Islay have legendary status for producing “peated” whiskies. Bowmore is one of the most famous producers of peated whisky, alongside Ardbeg, Lagavulin and Laphroaig on the Isle of Islay. If you are keen to try peated whisky, look no further than Islay! A “peated” whisky is produced by using “peat” to smoke the malt, which was the traditional method before the industrial revolution saw this replaced with coal in many distilleries. The distilleries on Islay did not change with the times, and thank goodness for that! The Bowmore single malt whisky has been distilled on Islay since 1779! The production of the Bowmore single malt whisky is claimed to remain unchanged, including the use of floor malted barley. The water is taken from the Laggan river which is rich in peat, and if that was not enough to impress the malt is said to be smoked in a peat fired kiln just as Bowmore’s ancestors did over two centuries ago. The Bowmore 12 Year Old is matured in the oldest maturation warehouse in Scotland which is, the box reads, ‘the only one below sea level’. 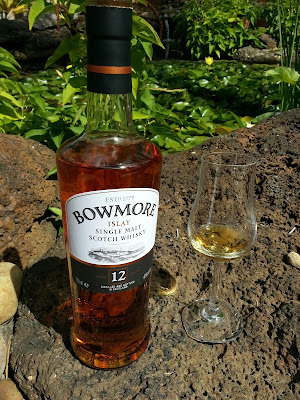 The Bowmore 12 Year Old is a descent Islay whisky. It has a good balance that carries diverse character that can be unpacked carefully. The picture I took above I think captures the character of this whisky – the earthiness of the sand and rock, the freshness of the water, the saltiness of the sea nearby, the peated smokiness of the vegetation, the mellow bitter wood floating in the water and the brightness of the sweet notes (sugary peppermint, stewed apple) shining brightly like a warm summer day. 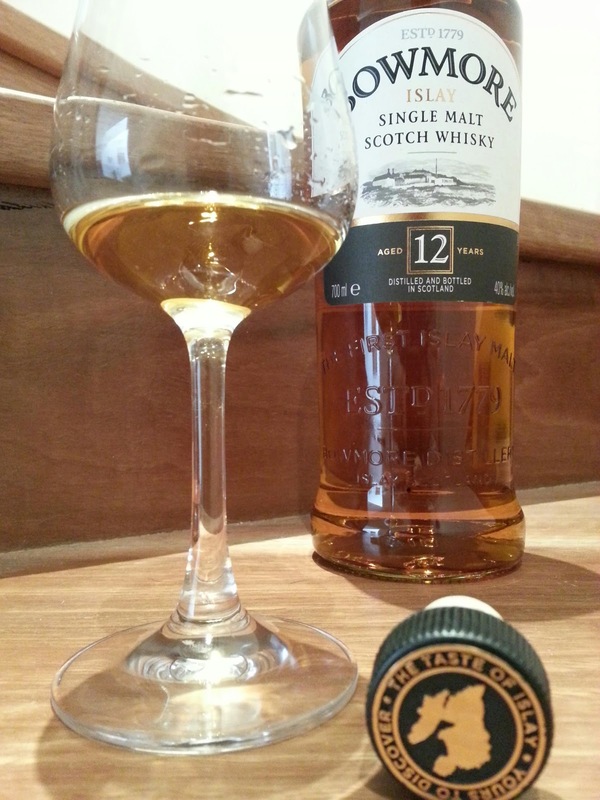 The character in this whisky impatiently escapes from the bottle as the cork pops! Almost immediately I can smell a fizzy sweetness similar to sherbet on the nose with hints of sharp peppermint and lemon. Like smashing waves against the pier, the smell of sea salt and seaweed fill the air as sea shells and the scent of the beach add a district coastal earthiness. The whiff of oak gently develops, but the fog of peat rolls in unabated and with it sweet peach and mild citrus such as lemon and mandarin. That peat is gentle and calm like waves splashing softly. A shimmer of sweetness also develops, almost like a sweet sherry dashed over stewed apple. The peat is lush and wet, almost mossy and not overpowering. There is something wonderful about a peated whisky that allows the character of the whisky to shine through. Oftentimes the peat can overpower and mute the other character in the whisky, but this Bowmore lets some flavours of the sea and sweet fruit glimmer. The balance is good as a sudden gust of peat brings with it the saltiness of the sea and the earthiness of the beach but all this is moderated by sweetness in the form of peach and stewed apple. All the while a slight bitterness in the form of oak balances against that sweetness, as bursts of sugary peppermint crack like popping candy igniting sparks of light in the smokiness. After five tastings I began to dislike the watery texture that I feel develops in this whisky, and result with a dull experience. In my personal view I would much prefer a peated whisky from the other Islay distilleries; Ardbeg, Lagavulin, Bunnahabhain, Bruichladdich, Caol Ila or even a vatted malt like Big Peat! I found the Bowmore lost its spark and that watery texture I felt had developed was disappointing. The finish is long and extremely enjoyable, as the flavours linger on the tongue strongly.Blind tasted alongside Lagavulin 16 Year Old, Bunnhabhain 12 Year Old, Ardbeg Galileo and Connemara Peated. I was least impressed with the Bowmore 12 Year Old.